November 3, 1993: Creation of the proprietorship Sweet Embroidery as CRAFTSMAN-HEAD OF BUSINESS in Angoulême in Charente (16). guided me on the road to the craft. This is the technique used for hand embroidery design haute couture dresses. April 5, 2005 Obtaining quality "CRAFTSMEN ART awarded by the President of the Chamber of Trades of the Charente. At the Carrousel du Louvre in Paris from 8 to 11 November 2007 . 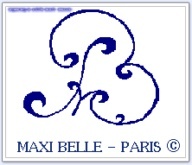 Stages Lunéville embroidery and ribbon, in 2007, school LESAGE PARIS to acquire a "perfection in the art." 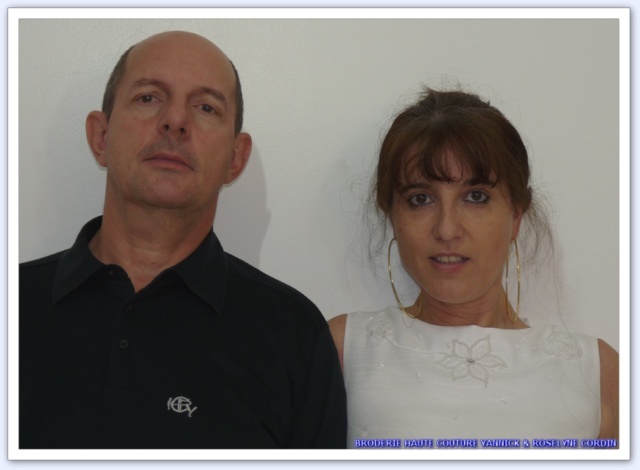 It is acquiring a "know-how manual, french ancestral heritage." 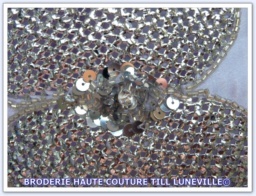 Lunéville embroidery, embroidery Haute-Couture with embroidery craft Tunisian which is called "Till" (phonetic pronunciation) and made holes or points stem from a metal wire gold or silver Using a needle or very special . and known under the name "TILL LUNEVILLE ©". 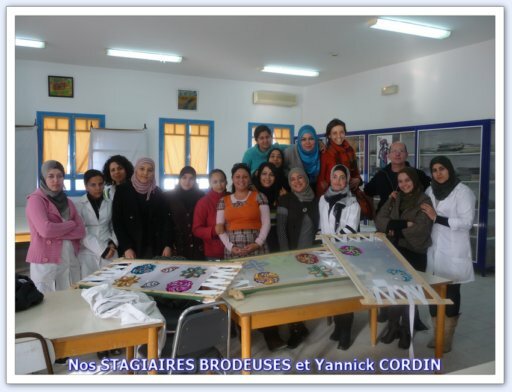 Since October 2009, Expert Teacher Embroidery Haute Couture in Tunisia! The Ministry of Vocational Training and Employment, Mr Mohamed AGREBI, and the valuable assistance of professional and caring Mr. Director General of the Tunisian Agency for Vocational Training (ATFP) Mr Abdalah BEN Abdalah, gave us their confidence, through a creation of a "luxury club" at the Sectorial Training Center in Monastir Clothing, to train 20 trainees at the haute couture embroidery. A First in the history of Tunisia! Indeed, the embroiderers of Nabeul and Hammamet pose flakes and pearls to the place of business and the needle only! COLLECTION DISCREET CHIC and ELEGANT ! Offer to seductive "businesswomen", to active round women, a classic and timeless collection, structured and glamorous line nod to the fifties and sixties, mixed ancestral heritage manual of French "Haute Couture Embroidery" to "standardize "the technique usually used for large fashion shows of haute couture, and to live in" all circumstances ", for" EVERYDAY lIFE ". Collection uniting the Black, Authenticity, and Tradition Wellness!